Sunflower unfurling. 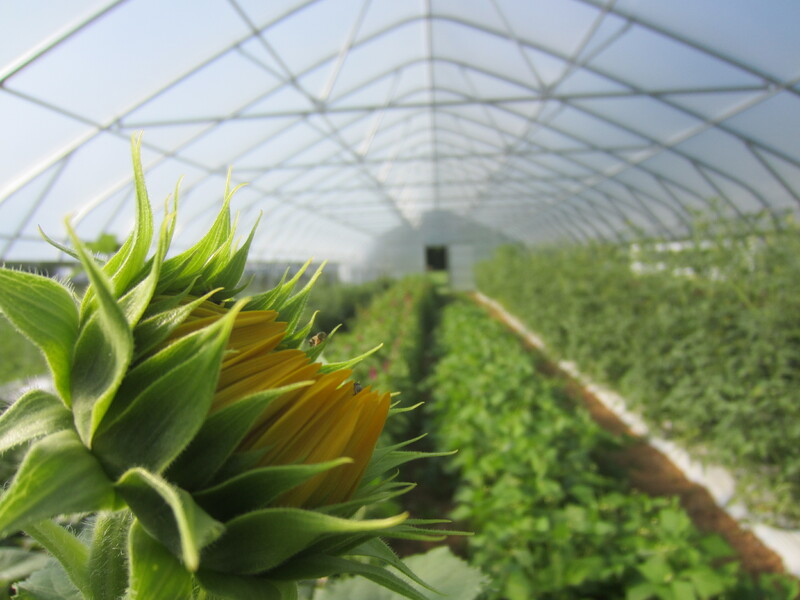 We’ve been harvesting summer squash and sunflowers from the new tunnel! 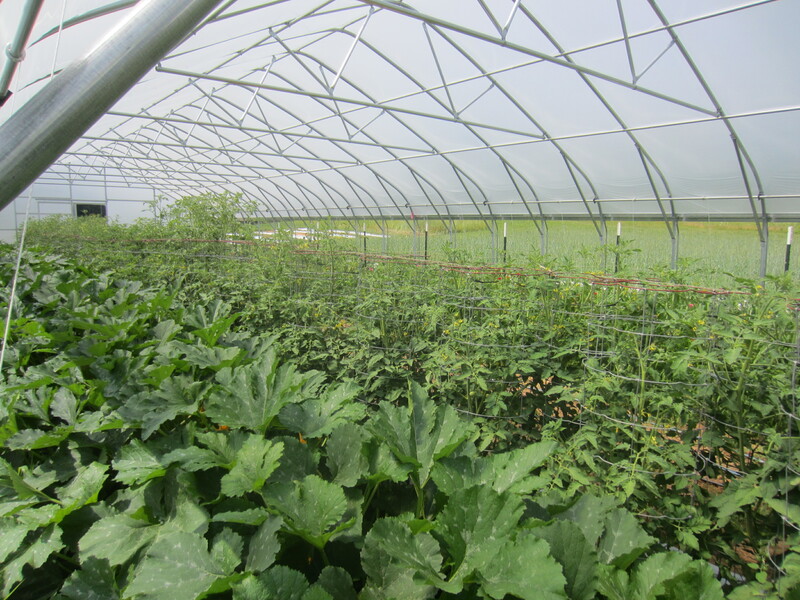 The squash row and tomatoes in the tunnel. The squash plants are huge- about 4′ tall- and we can barely squeeze in between the rows to pick them. A beautiful crop of sugar snaps; that is, it was until the trellis string broke and some of the vines toppled over during the last storm. Curly kale and my least favorite summer weed. 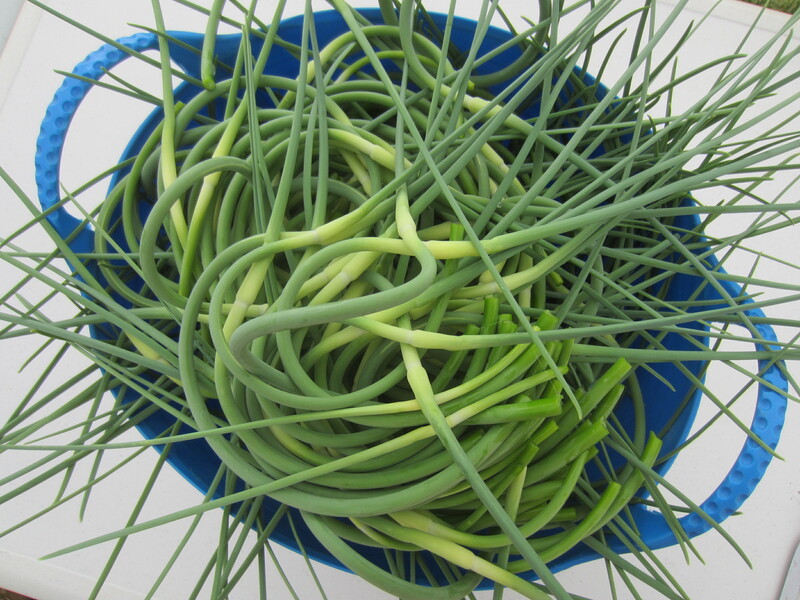 Garlic scapes… this means garlic harvest is not far off! 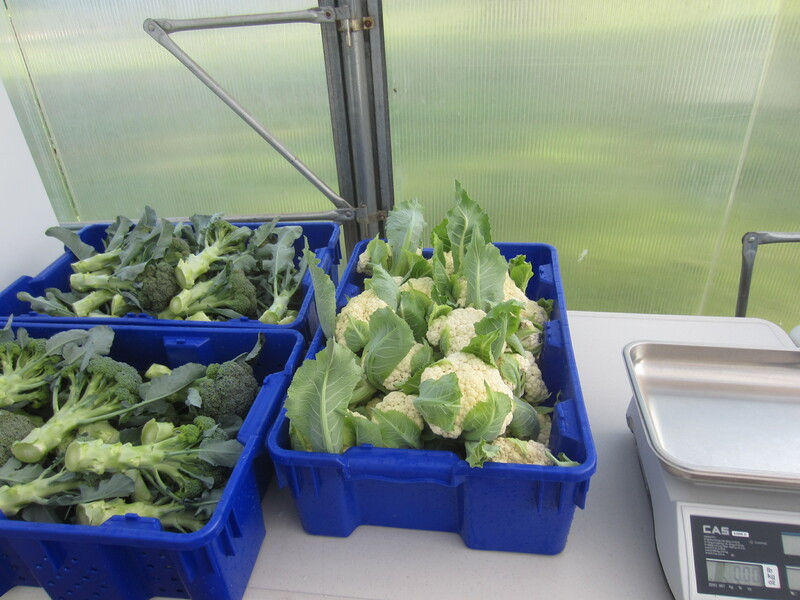 Our first successful cauliflower crop! Can’t wait to grow it again next year. The spring crops have done so well for us this year. 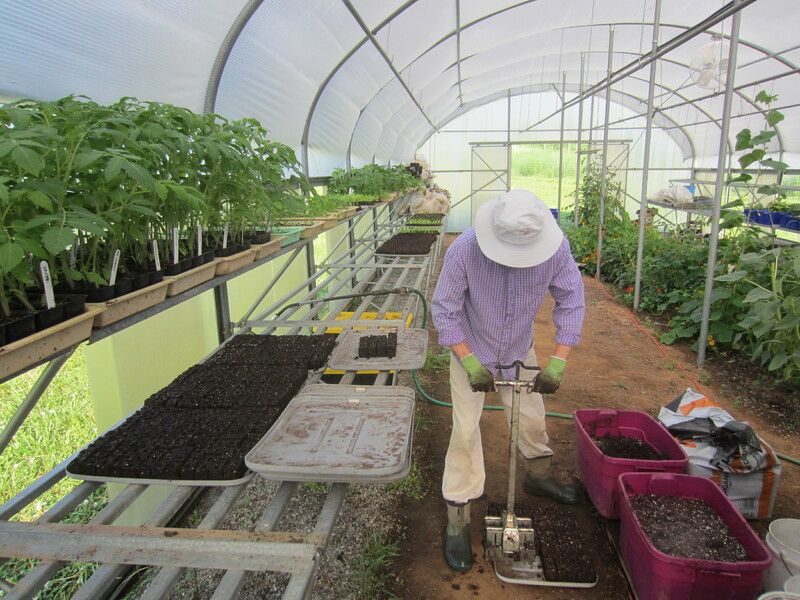 More tomatoes ready to be planted; making soil blocks for another round of seedlings. 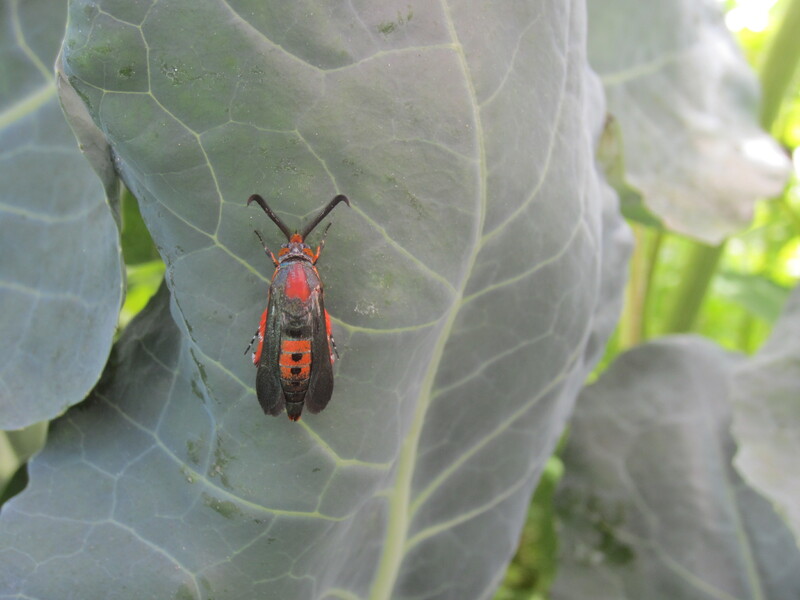 Curious insect on a broccoli leaf. 5:25 am on a Saturday morning. 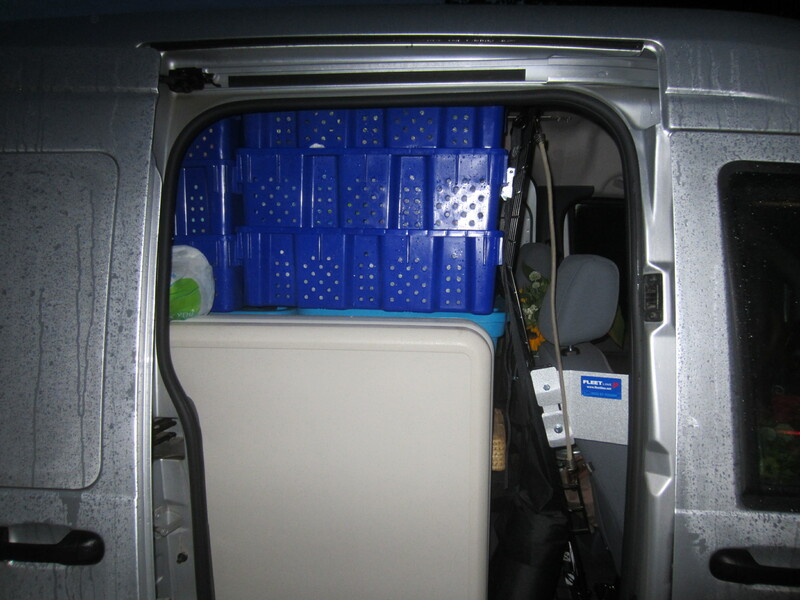 I don’t think we can fit any more in. 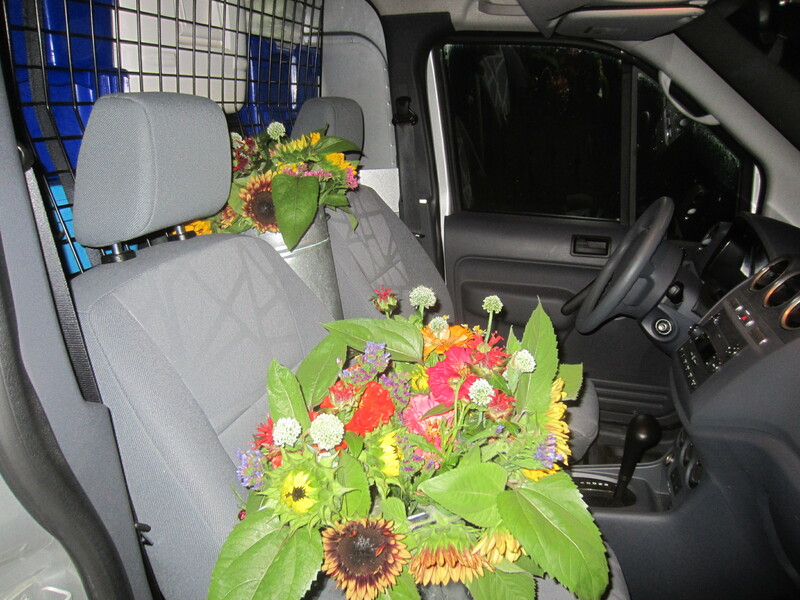 In the front seat I hold the flower bucket in my lap. 7:45 am. Almost ready for the morning rush. What a wonderful time of year. 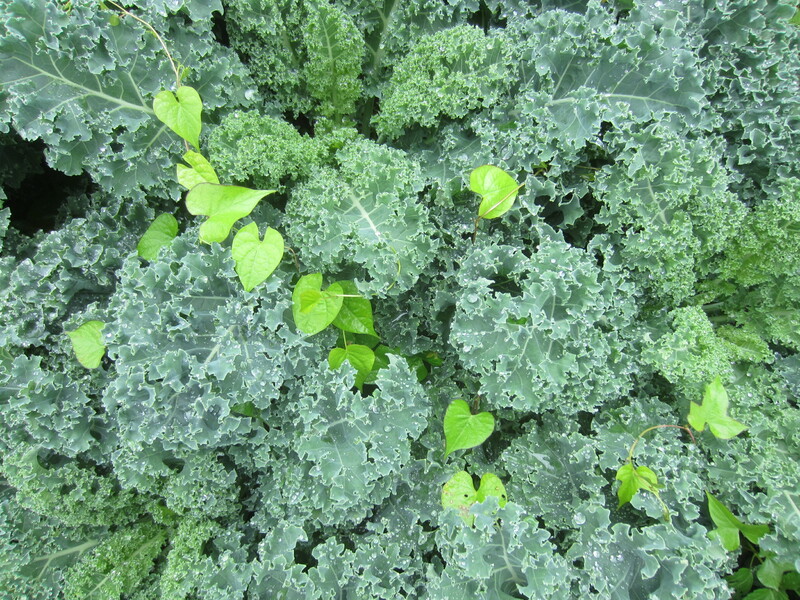 Lots of good things to eat as we still have the greens of spring and are just starting to harvest the fruits of summer. The solstice is almost here! 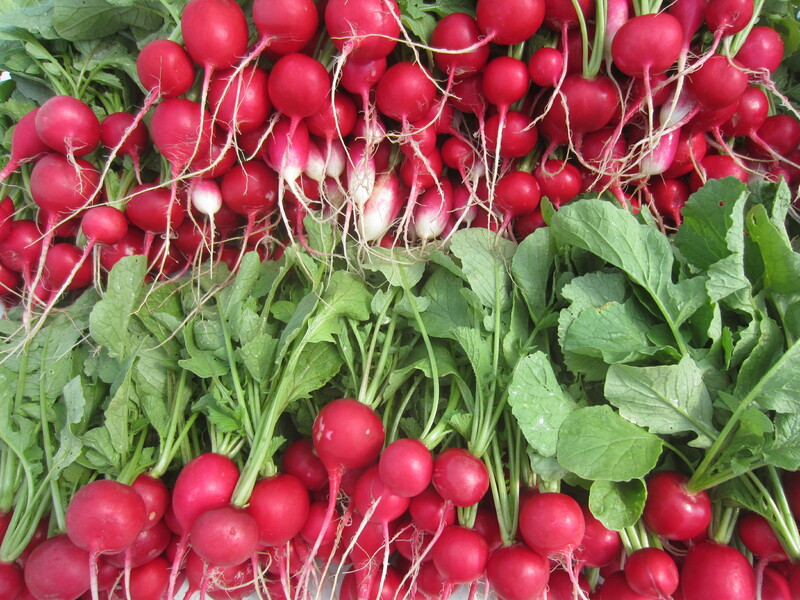 What a beautiful bounty, the cool, wet spring has been great for cool weather crops. 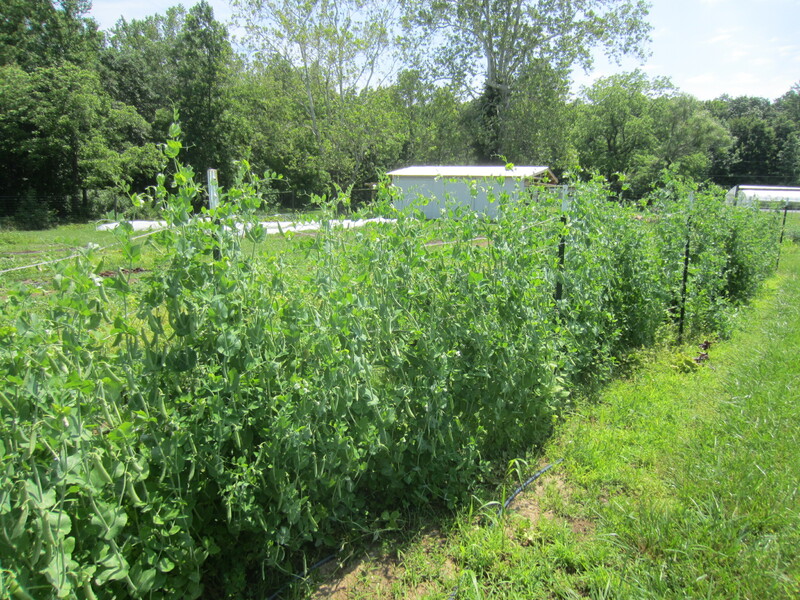 I also hate that weed, for me it’s a challenge in my asparagus beds. Doesn’t it feel great to get the early harvest to market and reap the rewards of all your hard work? I bet you guys sleep well on Saturday night. Keep up the great work and thanks for taking the time to post the updates. You’re right, it’s the best having the first stuff at market! 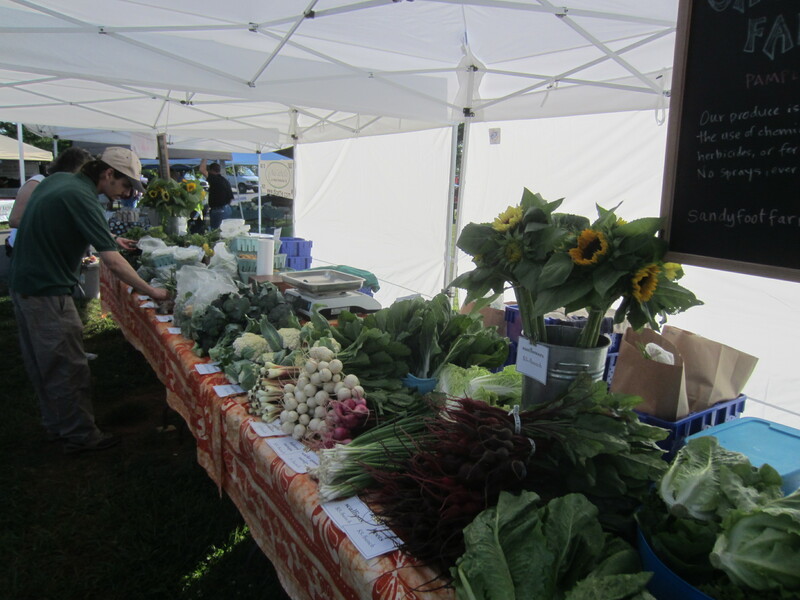 We do sleep well on Saturday night, though it is hard to ever socialize with this market schedule. So glad to see the pictures. Makes me feel like I’ve been there. How beautiful!!! Garlic scapes are the flower stalk of the hardneck garlic plant. You’re right, the garlic bulb itself does grow underground, but the scape comes out the top of the leaves similar to an onion sending out its seed stalk does. I need an I love it button! Thanks, Bill. Our summer crops are definitely delayed also. But we can at least be thankful for the awesome spring! Not sure what the rest of the season will have in store for us… (besides lots of work)! We just picked the first slicer tomatoes last night so I guess summer is really here. And all the rain!!! It is driving me crazy, we haven’t been able to plant or till for several weeks so the garden is a real mess, not to mention the crops that are rotting from all the moisture. But I have definitely enjoyed the cooler temperatures this year.